Winter ugh winter! Winter is fast approaching. I really hate winter. Which is fairly ironic considering I love Christmas, and was born in the month of January. I am just not a snow, freezing rains, wind chill kinda girl. Although I do love my pink pea coat. Anyways I figured since winter is chasing me down, and there is nothing I can do to stop it from catching me. Which is depressing. I should think of something that I love about the warm more pleasant time of the year. So I decided to turn my focus on one of my favorite flowers the Iris. The greek word for Iris is rainbow. Can't get much more beautiful than that. 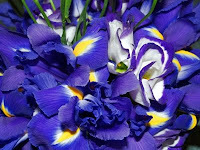 The Iris flower is symbolically carries many different emotions; wisdom, purity, faith, hope, passion, and many more. It's probably one of the reasons I love it so much. It's a complicate flower a lot like the human race, it gets all confused to what emotion it wants to convey, yet still is a thing of beauty. Iris was also the name for a greek goddess the messenger of love in fact, and is probably where the flower got it's name or the fact it means rainbow gave the flower it's name, because it comes in a numerous amount of colors. I am sure the science/garden geeks are still arguing over that somewhere. Either way I don't really care where or how it got the lovely name. I am just glad they exists for me to admire. Purple Siberian Iris are my particular favorite, but I believe that all Iris have a touch of true beauty. I always love admiring my Granny Sadie's Iris garden, and the fact she has them labeled by name is also impressive. There is even an Iris named Skywalker which fascinates my geeky side. My favorite flower carrying the name of my favorite hero. Yes this beautiful, mysterious, dainty looking flower is one of my very favorite things about spring and early summer. So when winter finally catches up to me, I will be dreaming of Spring and Summer and the beautiful Iris it will bring into bloom!